One of the reasons I enjoy being a teacher is that, in ways large and small, I can make a positive difference in the lives of others — just as many of my own teachers have done for me. Today’s Music Monday investigates this idea. For me, one teacher — Professor Eloise Hay — who I only knew briefly in 1996 during my last class at UCSB made an impact on me, though I wasn’t initially aware of her influence when it happened. (I was too concerned with graduating). It was in this class — English 40, English Literature 1800 to 1900 — that I was first introduced, at least academically, to William Blake. Since then I have always felt an emotional and creative connection with Blake, and his imaginative interpretation of humanity. My interest in Blake inspired me to launch “WilliamBlake.com – Cybersongs of Innocence.” While it has not yet evolved into the resource I envisioned, I hope to eventually expand it into a user-created Wiki (as time and resources allow). Why I mention this is that it was on this date — April 30, 1996 — that Professor Hay died of inoperable brain cancer. Although I only had her for that one class, and never knew her beyond the 12 weeks of my last quarter at UCSB, I remain grateful for the opportunity to have learned about such a wonderful craftsman of creativity as William Blake. One of Blake’s more famous works is a short poem titled “And did those feet in ancient time” which can be found in the preface to his epic 1804 work Milton a Poem, one of his collection of Prophetic Books. Today this short piece is more commonly known as the anthem “Jerusalem” — for which, in 1916, Hubert Parry wrote the music to accompany Blake’s words. The theme of the poem is that, during his lost years, Jesus travelled to (what is now) England and visited Glastonbury. The song is a popular English anthem and is performed at various events each year — including the April 29, 2011 wedding of Prince William and Kate Middleton (another coincidence and reason why I share this song on this date). Music Monday: Hamlet or Hip-Hop? Since William Shakespeare died on this date in 1616 — and is widely thought to have been born on the same date in 1564 — it seemed fitting for today’s Music Monday post to shine the spotlight on the famous Bard of Avon. After some searching, I discovered the TEDxTalk Video below that features hip-hop artist and founder of of the The Hip-hop Shakespeare Company, Kingslee “Akala” Daley. While not entirely music in the true sense of Music Monday, in the video, Daley connects modern hip-hop music with Shakespeare’s melodic rhymes and also discusses the wider cultural debate about the power of language. Similarly, a recent Edutopia article titled “Teachers Shake Up Shakespeare with Digital Media,” explores how teachers are now using digital technology and social media to help their students understand and embrace Shakespeare. In response to a subject students typically bemoan as boring, they are eagerly creating raps, podcasts, and short films. Given the above, it is only fitting to proclaim: if music be the food of love, play on! Sometimes you can say more with music than you can with words. In that spirit, I am today launching a new feature on this blog in which I will showcase a musical selection on Mondays appropriately titled Music Mondays. Due to the nature of my schedule, there might not be an entry here on every Monday, but whenever the mood strikes, there is some thematic relevance, or some especially poignant purpose in doing so, you will find music here for your aural enjoyment. 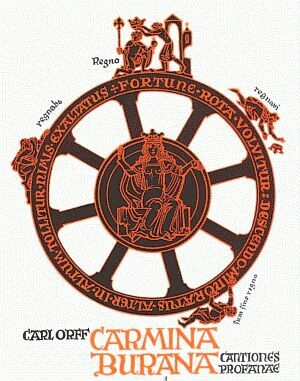 This selection — the opening movement of German composer Carl Orff‘s “Carmina Burana” — is a “scenic cantata” and is based on 24 poems from the medieval collection Carmina Burana. This piece — which deals with the idea of fate (fortuna) — was chosen because today is the 60th birthday of Bill Belichick, the head coach of my favorite NFL team, the New England Patriots. How’s that for good fortuna? Of course, there have also been struggles, but, Belichick took a team from the bottom of the NFL and made it a championship contender. This piece is also played at each Patriot’s home game as the players enter the field. 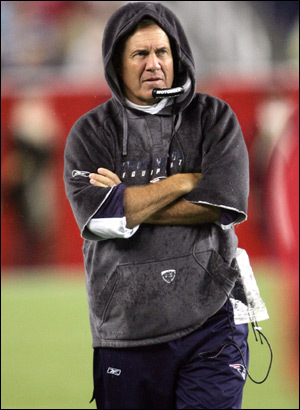 Lastly, Belichick casts a rather “ominous” presence while on the sidelines during games and, due to his frequent wearing of hoodies, has often been called “Darth Hoodie” (a reference to Darth Vader).